The Chefman RJ38-P1 is a small, attractive air fryer with adjustable settings and a digital display. The sleek design of this Chefman air fryer blends well with any decor. The boxy design is made to provide even heating for foods as they cook. It also gives you more usable counter space. The Chefman has a programmable control for cooking foods of all types in a short amount of time. It saves you even more time by being easy to clean. All removable parts of the Chefman RJ38-P1 are dishwasher safe. Best of all, the machine comes with a one year hassle-free warranty as well as a 30 day no questions asked full return policy. The air fryer does not include any accessories, such as a food divider or baking pan. It does include a user guide and cookbook. In addition, all owners of the Chefman RJ38-P1 receive access to Chefman’s online portal, Club Chefman. This portal contains tutorials, videos and recipes. This Chefman air fryer is a sturdy 12 pounds. Its dimensions are 14″ x 14″ x 14″. The appliance is available in a neutral black with stainless steel accents and a digital display. A 2.5 quart basket provides room to air fry, bake or reheat plenty of food for one or two people. The basket and all removable parts are non-stick and dishwasher safe. This model does not include a separator for cooking different types of food at once. The Chefman RJ38-P1 has an LED display that is used for both time and temperature. These are controlled via the panel that offers settings to raise and lower the time and temperature, start the machine and put air frying on pause. Temperatures on this air fryer range from 175 to 400 degrees, making the appliance suitable for a wide variety of foods. The 30 minute timer gives ample time to cook nearly any kind of dish. Indicator lights show home cooks when the unit is powered up and when the heating element is on. The machine includes a cooking basket and frying pot, which has an easy release button. All removable items on this model are dishwasher safe. This highly rated air fryer has received overwhelmingly positive customer reviews. Most users agree that the Chefman RJ38-P1 is very user friendly. Customers enjoy the digital display because it is both easy to read and use. Customers also appreciate the design of the frying basket. Thanks to the easy release button, the small amount of oil that accumulates does not have to be skimmed away before serving. The model comes with a standard, one year limited warranty. All machines come with a warranty card that allows customers to thoroughly explain any problems that might arise. The appliance is warranted against malfunction that is due to workmanship or material defect. The company will repair or replace the machine. If it is not repairable and the model is no longer available, the warranty allows for the company to replace the appliance with a different model. Under this warranty, any costs incurred during shipping must be covered by the user. Chefman does offer a 30 day, no questions asked money-back guarantee. Should I Buy the Chefman RJ38-P1? The Chefman RJ38-P1 is a popular air fryer because it is simple to operate and built to last. Most users agree that the Chefman provides an excellent cook on all foods. It is also a no-muss, no-fuss appliance thanks to its dishwasher safe parts. We recommend this air fryer if you want an excellent counter top appliance but don’t have a lot of mouths to feed. The small size will easily cook meals for small numbers of people. You can also use it as a replacement microwave to reheat pre-cooked foods. The average price makes it a fine choice to use in one’s own kitchen or to buy as a gift. 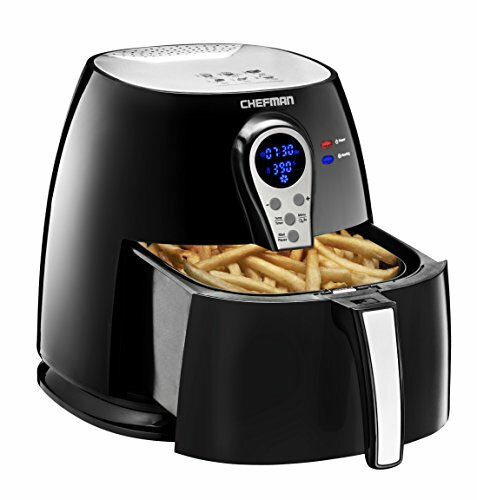 If you own this Chefman Air Fryer we’d love to hear from you. Share your experience with this airfryer model below.